This Dutch oven's square, legless design is perfect for the campfire and oven. Plus, flip lid over for an instant ribbed griddle for the stove. Recipes included. I am so excited to have this piece in my home. It is beautiful and I know it will last forever! 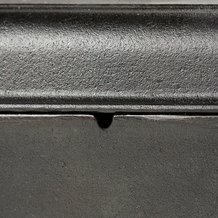 Great piece of cast iron! 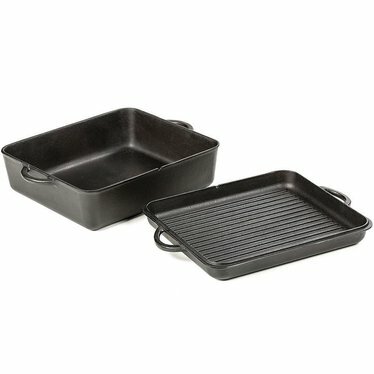 Just what I needed to add to my collection of cast iron. I have already cooked lasagna in the base and cooked bacon on the top. What a versatile piece of cookware. Every thing I expected and more. Perfect for lasagna, roasts, bread and so on. 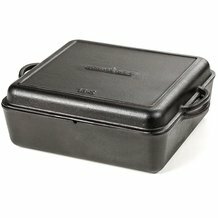 The lid I use for steaks, burgers, sausages and the list goes on. Thank you! !